If you just bought one of the Tyros models, you may have purchased a whole "kit" complete with speakers and a keyboard stand (see image). The Yamaha speakers and stand are extras. You can purchase them along with your keyboard, but you don't have to. Many owners may not need the Yamaha stand or may prefer a different one and many owners opt for a higher quality speaker system. The mid-range models have built-in speakers but the stand would be an "extra." Before you get started, let's consider some of the accessories you may want to have with your Yamaha keyboard. There are a wide variety of keyboard stands available on the market and they do vary in price. They also vary in stability and strength. While your keyboard may not be very heavy, if you tend to "pound" those keys, the keyboard may bounce around a bit on the more inexpensive stands. Actually, the sturdier the better. The Yamaha stand shown above is certainly very sturdy, but it does not fold up nor is it adjustable. If you want to transport your set up, you may want a stand that you can fold and easily take along with you. You may also want a stand that you can adjust the height to a level that you are comfortable with. 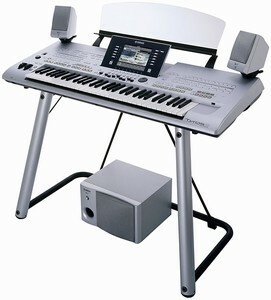 You do not even really "need" a keyboard stand -- you could put your keyboard on a desk or table. This would give you a very firm foundation, but it would limit where you could move your keyboard. If you have more than one keyboard, you could purchase stands that are built to hold more than one keyboard. Generally, you will find these keyboard stands in music stores or on the internet. Some examples are shown in the left sidebar on this page. While some players prefer to stand at their keyboard while they play, most owners sit down. Therefore, you will also need a bench or a chair. A standard chair may be too low. If you have a piano bench, that would be excellent. You could purchase a "portable" piano bench with an adjustable height so you can set the bench position where you feel most comfortable. I have a couple of these benches and they have worked quite well. All of the Yamaha keyboards come with a Music Rest. However, these are simply inserted in a groove on the mid-range models. If your keyboard is bouncing around as you play, rest assured, that the music stand will, eventually, bounce right out of that groove. It can also seem a bit flimsy if you have one of those giant fake books on it. The Tyros music rests fit into slots on the back of the keyboard and are more secure, but they are also set back a few more inches from the player. If you do use music books, you may want to consider a separate music stand as an alternative. These tend to be sturdy metal stands that will easily handle any of your music books and can be positioned behind the keyboard for convenient viewing. If you are handy in the workshop, you might want to take a look at Phil Hall's article "Industrial Strength Music Rack" and see how you can build a stronger rack yourself. If you need additional light on that music, there are some nice portable music gig lights you can buy. Check out the Pro Clinic discussion on Music Lights. I have purchased the light shown above and it works great. If you are playing at home for yourself, the built-in speakers in the mid-range models may very well be all that you need. They produce excellent results and will be loud enough in your study, family room, or bedroom. Of course, in the bedroom, you may want to be using ear phones! If you plan to entertain others, or if you just like your music to be a bit louder, you will want more powerful speakers. Many users have found the Logitech Z-5500 model to be good choice (see Gary Diamond's article "Travelin-Easy with the Z5500" and Warren Peter's article "Installing the Z-5500 on My 3000"). These have also been used as the basis for some home-made speaker systems (see Posey's articles "POZ P1 Speaker System" and "POZ PII Logitech Conversion"). The Logitech Z-5500 has since been replaced by the Logitech Z0906. At the high-end, the Bose L1 compact system has received rave reviews providing a balanced sound level to audience members close to the performer as well as those far from the performer. Check out the PSR Tutorial Forum for many comments on the Bose L1 and other speaker systems. One other accessory you may want to consider is a foot pedal. There are two standard Yamaha foot pedals, FC-4 and FC-5, either one of which will do the trick. These two are foot switches -- stepping on them activates a function; stepping on them again deactivates the function. For example, you could use a foot switch to start and then stop play or turn sustain on, then off. Yamaha also has a foot controller, the FC-7, that allows you to control the volume of your instrument. Most of these keyboards allow for at least two foot pedals; the Tyros models allow three. Using controls on your keyboard, you can assign specific fundtions to each foot pedal. But these are optional, you don't need a foot pedal to start playing your keyboard. If you happen to have the PSR-3000 or a later model (Tyros2/3/4/5 or PSR-S900/S910/S950), one other accessory that you will certainly want is a USB flash drive. In the next lesson, we'll discuss these wonderful devices for storing your files. If you have a PSR-2000, or PSR-2100, feel free to jump ahead to Keyboard Panels.